When planning a vacation in Maui, it can be overwhelming trying to decide what activities to choose from. With so many adventurous offerings, how do you know which is the best hike for you on Maui? 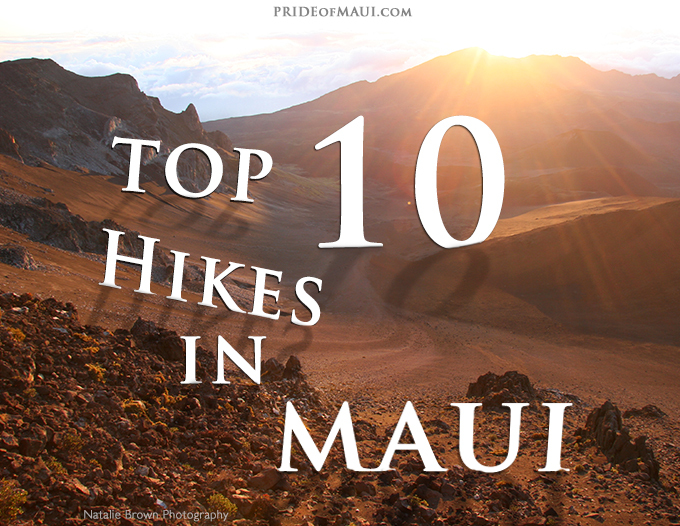 Take the stress out of your vacation planning, and check out Pride of Maui’s Top 10 Hikes in Maui article. Here, you will learn all the awesome details about each hike; how long it is, if it’s appropriate for children, and where on Maui it’s located. 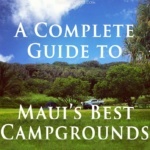 Discover unique eco-zones in Hawaii, plan a day hike or an overnight camping trip, and feel amazing knowing that you have the most thorough information available. Waste less time on vacation, and maximize your valuable time in paradise. With real facts and the best research available at your fingertips, enjoy the local expert knowledge provided below. Happy hiking, Malama Pono, and A Hui Hou! ‘Iao Valley State Park always provides a beautiful day trip activity on Maui. 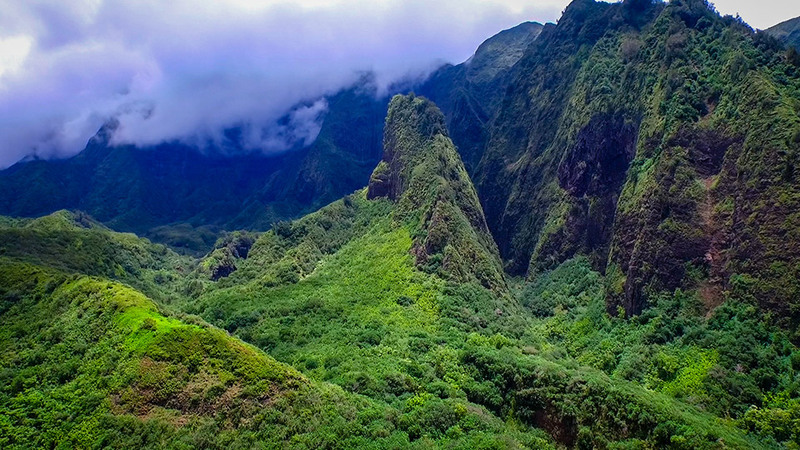 This historic state park is home to the infamous ‘Iao Needle, and the site of the Battle of Kepaniwai in 1790, where King Kamehameha I conquered Maui’s warriors in pursuit of uniting all Hawaiian Islands. 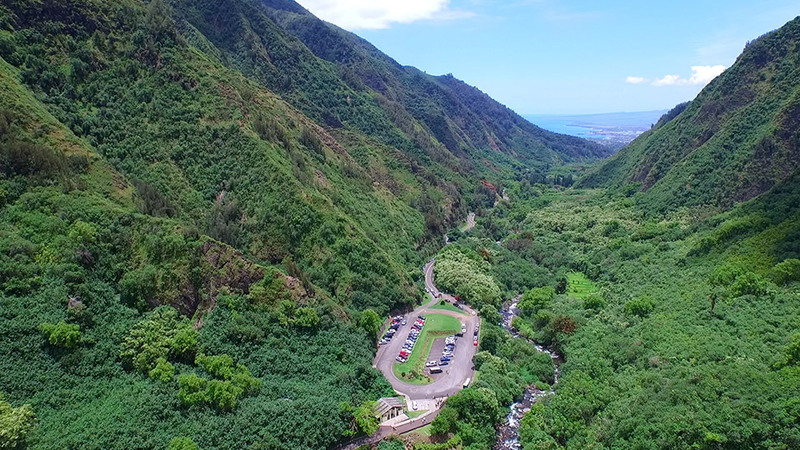 Within this 10 miles long, 4,000 acre park, guests, families and fellow hikers can explore the lush scenery and native Hawaiian flora and fauna by way of a paved pathway. The park is known as a spiritual rainforest full of mellow hiking trails, waterfalls, swimming holes, and BBQ and picnic areas. ‘Iao Valley State Park gates are open from 7am-6pm, with a $1 donation entrance fee per person, and $5 for parking. Please keep in mind that the facilities do not have drinking water, so come prepared! For the best view of the ‘Iao Needle, arrive early morning before the clouds start settling in the mountain valley. This is a perfect place on Maui to visit with kids! For more information, please visit Iao Valley State Park in Central Maui online. Haleakala’s Sliding Sands Trail is located within Haleakala National Park and is the summit of the Crater. At 10,000 feet, near the Haleakala Visitors Center, this trail travels 6 miles through the south base of the Crater leading through loose cinder all the way to the Kapalaoa Cabin at approximately 7,400 feet. Just past the Kapalaoa Cabin, the trail mellows out into flat grassy areas as the topography naturally changes due to decreasing elevation. Sliding Sands continues another 4 miles to the Paliku Cabin, where hikers can then access the Kaupo Gap and hike all the way down to 300 feet above sea level. Then, hikers can walk a bit further to the Kaupo Store and treat themselves to an icy cold beer. Sliding Sands is not suggested for small children or amateur hikers but is excellent for those up for one of the best adventures on Maui. This is undoubtedly one that you and your friends will never forget! Fees are associated with the Haleakala Visitors Center pending all activities. For more information, please visit Sliding Sands Trail on Maui online. The Pipiwai Trail is located just above the Seven Sacred Pools of Oheo Gulch in Haleakala National Park. If you are driving the “Road to Hana,” you will not want to miss this beautiful adventure! To get here, drive past Hana town for about 15 minutes. You will find the trailhead near mile marker 42 off Highway 31. The hike begins across the road from the Haleakala Ranger Station and is free of charge. However, there are fees for parking and/or camping at the Oheo Gulch Haleakala National Park. The Pipiwai Trail is a 4-mile (round trip) hike that takes approximately 4 hours to complete. However, keep in mind that you can easily spend more time lingering and exploring this area. There is plenty to see! This hike does not fail to deliver. It is everything one could dream of experiencing on a tropical island exploration. With each turn on this hike, you are blessed with a new and amazing view. Key points include giant bamboo forests, tranquil stream, an enormous banyan tree and several spectacular waterfalls, including Makahiku Falls and of course the 400 ft. Waimoku Falls. This is the perfect hike for those looking for a waterfall adventure on Maui. As with all stream and waterfall hikes, hikers should remember to proceed with caution when hiking through muddy pathways and when crossing over water on slippery stones and rocks covered with moss. Proper footwear is a must, and this hike is not appropriate for small children. For more information, please visit Pipiwai Trail. Located south of Wailea (as far as you can drive on this road) is La Perouse. It’s an oceanfront archeological site that remains sacred to the native Hawaiians. The drive here takes you past Makena’s Big and Little Beach, through the Ahihi Kinau Reserve, and over a long stretch of lava fields. The large and jagged lava formations here are from the most recent eruption of Mount Haleakala, in the 1790’s. The road becomes very narrow towards the end. You will know that you have reached your destination when you see the horse corral and a stone monument. The parking lot is located just past there. 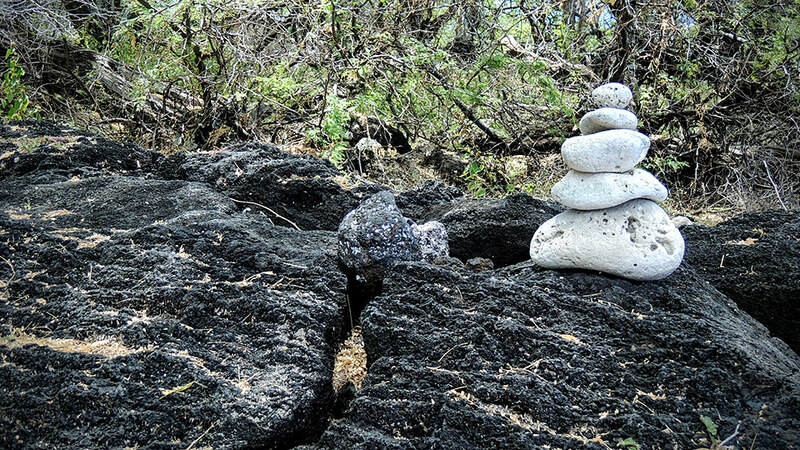 The Hoapili Trail will take you over jagged lava fields that are not ideal for small children. You will need real shoes on this hike, as loose lava can make the walk challenging. Sneakers or walking shoes will do, not flip-flops. Also, make sure to bring plenty of water. It can get hot on the trail, and there is not any drinkable water along the way. The trail starts near the water’s edge and is easy to find. You will pass some ancient Hawaiian structures and ruins along the way, which are historically significant and should not be disturbed. It is very important to remember to always stay on the marked trail and never to move any of the rocks at this site. At the end of the trail, you will find a beautiful and pristine bay with crystal clear waters. This is a great place for experienced and advanced snorkelers to explore. You can also see some dramatic olivine pools and visit the La Perouse Bay lighthouse. For more information, please visit Hoapili Trail. Twin Falls is located just a 20-minute drive East of the Historic Town of Paia on Maui’s North Shore. This site is found easily off Hana Highway, marked by a gravel parking lot, and a fantastic Maui-style snack stand. It is possible to book a guided tour through Twin Falls, but it is easily navigated on your own. This hike is perfect for those traveling with children, with a capability to visit many different tropical waterfalls and freshwater swimming holes. All pathways are just dirt and gravel, so it is highly suggested to bring good walking shoes. The main pathway splits into both left and right fork, offering visitors options for which way to explore. Ho’olawa Li’iii’i (the left fork), is the footpath that leads to the most popular waterfall at Twin Falls. Via the left fork, you will come to an old rock masonry irrigation ditch. Just continue to walk over the cement blocks or through the stream, and you will finally come to the picturesque “Caveman Swimming Hole and Falls.” Ho’olawa Nui (the right fork), is also accessed off the main pathway, and leads hikers through 2 hand-dug irrigation ditches, and finally to another set of waterfalls great for swimming and photo ops. When venturing to Twin Falls on Maui, make sure to bring good walking shoes, bathing suits and towels, and bug spray for hikers prone to mosquito bites. Always exercise caution when jumping off rocks, and watch your step for tree roots sticking out of the walkways! There are no fees for entering or parking at Twin Falls. Learn more at Twin Falls on Maui. The Waihee Ridge Trail is an incredible day trip for the experienced hiker. Here, venturesome guests climb uphill for about 1,500 feet until they reach Lanilili Peak. That being said, the hike is nearly all downhill on the way back down. Wear some comfortable hiking shoes and bring lots of water for this adventure. This is not a hike suggested for children unless you have some exceptionally athletic teenagers. Once visitors reach Lanilili Peak, there is a bench where you can view a massive waterfall in the distance, and overlook Waihee Valley, the blue Pacific Ocean, and a glimpse of the outer island of Lana’i depending on the weather. 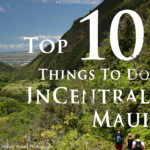 It is a sparsely populated area on Maui and a great option if you are thinking about venturing on a longer hike and want to test your hiking stamina. There are no fees for entering or parking at the Waihee Ridge Trail. For more information, please visit Waihee Ridge Trail in Wailuku online. Located on the most northerly point of West Maui, Nakalele Point is visited by travelers far and near. Visitors can hike down a rugged cliff trail to observe one of only three natural blowholes in the world! The trail is scattered with tide pools, fascination rock formations and dramatic views of crashing waves all along Maui’s gorgeous west shoreline. Nakalele Point is approximately 8 miles north of Kapalua. There are several trails to explore. Although, they all lead you to the blowhole, the trail that starts at mile marker 38.5 is the trail that leads you to view the popular heart-shaped hole in a lava rock formation, ‘Sweetheart Rock.’ This is also the safest route down. The hike down to the blowhole can be awkward making it unsafe for small children. Make sure that you are wearing the proper walking shoes (no flip-flops) and to stay off of the wet rocks, as they can be very slippery. When you reach the bottom of the rocky trail, you will find the blowhole off to your right. If you turn around and look behind you with the blowhole directly to your back, you will see the legendary heart-shaped hole that has been formed in the rocks. The heart opening is a perfect window to a coastal view and makes for a perfect photo opt. For more information, please visit Nakalele Blowhole & Sweetheart Rock. Situated at 6,750 feet, Hosmer Grove & Supply Trails offer some of the most fabulous hiking experiences and views in all of Maui. Hosmer Grove is accessed between the Haleakala National Park and Visitors Center. The trails and signage are both well maintained, and the hikes are just as pleasant as can be. Here, hikers begin their experience with a fragrantly calming hike through Cedar, Spruce, Eucalyptus, and Pine trees. Next, you can travel through shrublands, where hikers have popularly noted sighting four different types of Honeycreepers that are native to this area. The Hosmer Grove Nature Trail is accessed through the end of the road by the parking area. The 2.4 mile Supply Trail is accessed closer to the main road, marked by signs and a cattle guard gate. Plan and get an early start for exploring the Hosmer Grove Trails. Bring water, lunch and snacks, comfortable shoes, and wear layered clothing because the temperature at this elevation can sometimes change quickly. This is a great hike for those that are okay with spending an entire day hiking. There are no fees for entering or parking at Hosmer Grove. For more information, please visit Hosmer Grove & Supply Trails online. The Waihou Spring Trail Loop is located in Olinda, Maui, accessed by driving all the way up Piiholo Road. Guests can park directly outside of the trail entrance, where a pathway immediately leads hikers through a mystical baby Cypress, Eucalyptus, and native Hawaiian Koa and Halapepe forest. This is an old time favorite hiking location in Upcountry Maui and an undoubtedly gorgeous secret spot. 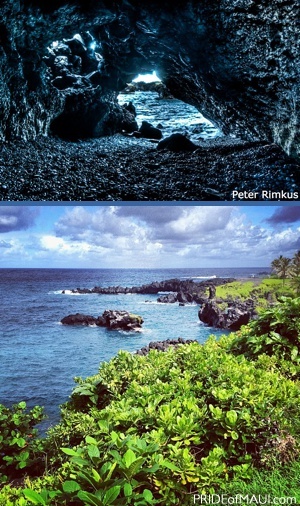 It’s almost unreal that a location like the Waihou Spring Trail Loop is found on Maui. It is a perfect example of how diverse Maui’s topography can be. Upon entering this hiking trail on Maui, visitors are guided through a complete loop that follows through an upper section to a ridge, then to a lookout point that towers above Maui’s North Shore coastline. The lookout is marked by a park bench, and for the avid hikers, the lower trail continues from the ridge down switchbacks to the Waihou Spring, a rock grotto, and mystical cave setting. The Waihou Spring Trail Loop is open from sunrise to sunset seven days a week. This hike is great for those with children, with the exception of the lower trail to the Waihou Spring, where hikers are advised to exercise extreme caution. There are no fees for entering or parking at the Waihou Spring Trail Loop. For more information, please visit Waihou Spring Trail Loop online. The Halemauu Trail in Haleakala starts from the west side of the crater summit down switchbacks towards the crater floor, and finally towards the east end of Haleakala Crater. The beginning part of this hike is pretty calm, as it travels through level-ish areas where hikers can experience an ever-changing volcanic eco-zone with loose lava rock and native shrubs. The switchbacks travel down through an approximately 1,500-foot long cliff area. 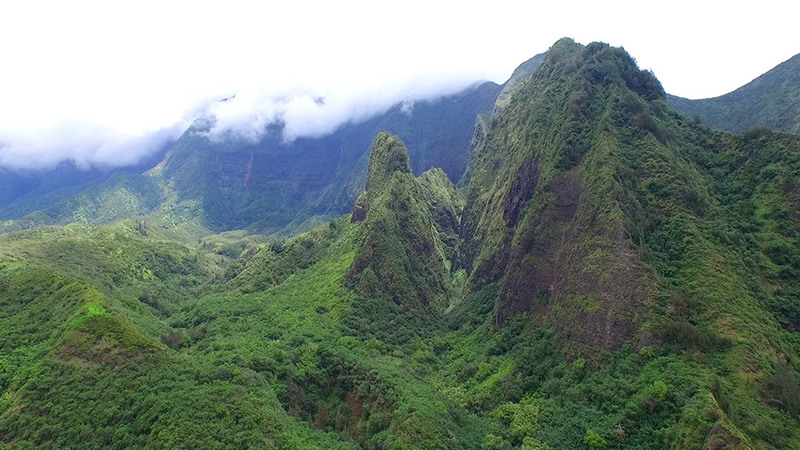 From here, hikers will be pleased that they chose to wear sturdy and comfortable shoes as they marvel in views of the Koolau Gap leading all the way to the Pacific Ocean. The Halemauu Trail travels 4 miles further through the crater floor, finally reaching the Holua Cabin at 7,000 feet. Hikers can then choose to continue across the crater floor for another 6 miles to the Paliku Cabin. Camping in Haleakala is an amazing life experience for all who bare witness to its magic! The best way is to go in style and plan by booking cabins. By doing this, avid hikers can make the most of their experience in the crater by resting up every evening for the next day and long stretch of Haleakala’s Crater. Fees are associated with the Haleakala Visitors Center pending all activities. For more information, please visit Halemauu Trail on Maui online. The Polipoli Spring State Recreational Area & Forest Reserve is genuinely one of Maui’s most magical areas and is an island favorite for avid hikers. There are several trails available, ranging from .6 to 7 miles in length. Polipoli is elevated at an average 7,000 feet above sea level, offering a skyline of unobstructed views of Maui’s South Shore and outer islands. That being said, it is imperative that visitors understand that the Polipoli trails are way above the field that is commonly associated with Polipoli. Four-wheel drive is needed to reach these trails, as they can become muddy and tough to manage. Four-wheel drive is required by law after the paved road ends. Visitors should be aware that you may be ticketed if you are caught in a car without four-wheel drive on this road. For those with a four-wheel drive vehicle, much of the hiking here is amongst the clouds. 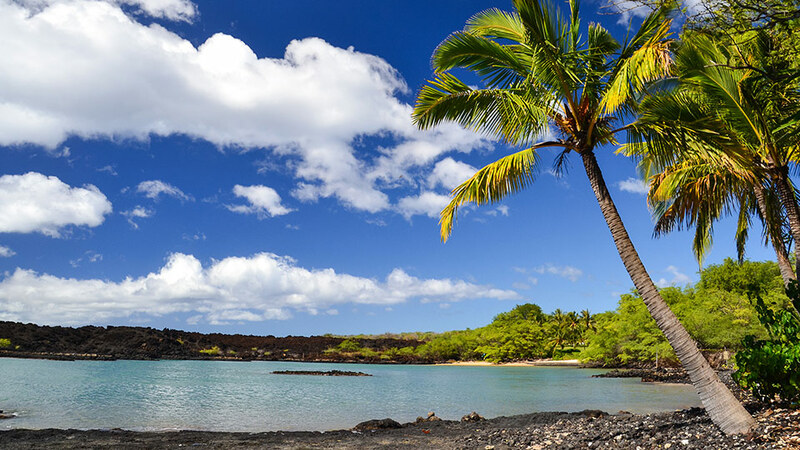 You may suddenly feel transported to an enchanted land full of redwood trees and native Hawaiian flora and fauna. The Polipoli trail has many choices and offers a network of trails, including shorter and longer options. Families can choose the easier shorter route, while passionate hikers will find miles of hikes to explore. These trails include the Redwood Trail which encompasses 1.7 miles, winding through Redwoods, trail junctions and tree groves. This is also the trail that accesses further trails, like the Plum Trail (via the Tie Trail (.5 miles) and the Boundary Trail. Also, keep in mind that hunting for wild boar, goats, and birds are allowed in the park. Hikers are encouraged to wear bright colors. For More information, please visit Polipoli Spring State Recreational Area & Forest Reserve, Kula. Mahalo for reading Pride of Maui’s Top 10 Hikes in Maui! Maui offers an abundance of hiking adventures for all levels, and we hope that this information is not only useful but helps you determine what will be the best hike for your vacation in Maui. What hike have you always wanted to do on Maui? Let us know in the comments below!